The InCMusic Tool by InvScribe is a fabulous new way to add music to games that support a "Custom Music" or "Custom Soundtrack" folder (future versions will add support for games that do not have a custom music folder). It is designed to allow game players to easily add their own music to such games with minimum hassle. In InCMusic Tool's primary mode (called Zero Byte File Mode), InCMusic Tool will create files in the custom music folder that take up no hard drive space. Even better, it does this VERY quickly! 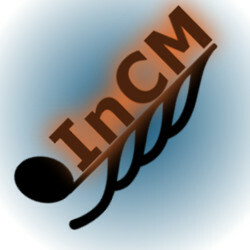 InCMusic Tool has many features, including other modes: Copy and Shortcut. Please be sure to use the latest version. Discovery: Zero Byte Files do not require your music to be on the same drive as your game's custom music folder (your C drive for The Sims 3). InCM Playlists no longer use the same icon as InCMusic Tool. I originally made this for The Sims 3 and then tested it with other games. Presets include The Sims 2 and several other titles. I thought about this long and hard. I decided to release it as free software for everyone to enjoy. There are no ads, nag screens, or anything like that. I only ask that it is not distributed outside of the channels that I have personally distributed it on (aside from sharing it with friends). 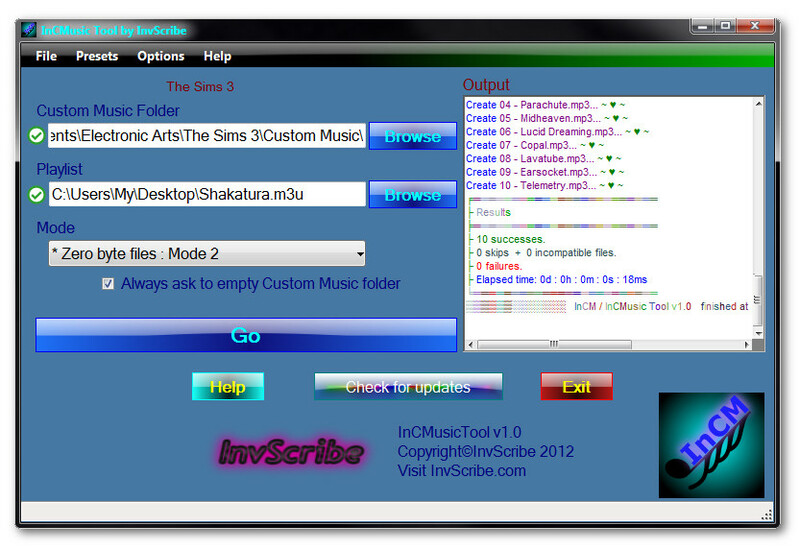 InCMusic Tool is compatible with all patch versions and all expansions. It is not a mod, hack, or object, and it is compatible with all known mods, et cetera. InCMusic Tool does not modify your game files. It simply creates the files you have asked it to generate. Windows XP, Windows 7. Windows NT, Windows Vista and Windows 8 are likely to work, but have not been tested as of this writing. Please post if you have installed and successfully (or unsuccessfully) used Zero Byte File mode on one of these Operating Systems. NTFS Formatted File System. This is the default for Windows Vista, 7, and 8. It is not the default for Windows XP. For Zero Byte Files to work, your music files must be on the same drive as your Custom Music folder. For The Sims 3, this is your C drive regardless of what drive you have The Sims 3 installed to. This is no longer required for Windows 7 or 8. -- Please note that these requirements are by design and are not something that I can change. The requirements above are for Zero Byte File mode only. The other modes have no such requirements. Beta testers have been thrilled with how easy it is to use InCMusic Tool. In short, the instructions are: Create a playlist in your favorite media player, then Save / Export it as an m3u file. Load it in InCMusic Tool, select your preset and mode, and click Go. Create a playlist in your preferred music or media player, exactly as you would normally. Export or Save that playlist as a .m3u file. Almost all music players support this function, but instructions vary from program to program. Instructions for some media players can be found here. Select the The Sims 3 preset. Next to Playlist, click Browse and locate your .m3u playlist. Select the Mode desired. For The Sims 3, Zero Byte File mode is recommended if your music is on your C drive. Otherwise, choose Copy mode. Click Go. You will be prompted to backup your original game music. You will also be prompted to save the InCM Playlist file. This file can be used later to mix and match playlists without having to perform the steps above. When InCMusic Tool is done, you can close it. Your game is now ready. In The Sims 3, you can select the Custom Music station from any radio. InCMusic_Tool_1_1_Full.zip is the tool itself. It contains one file. Extract it to any location. You may move this file anywhere, any time, and it will still work. InCM_Presets_All-09192013.zip contains all of the presets as of September 2013, including a The Sims 3 preset. Extract it anywhere, then run InCM_Preset_Installer. Select any or all presets listed, including The Sims 3, and click Install Selected Presets. You may then close the Preset Installer. InCMusic Tool is now installed. Run InCMusic Tool at any time. -- InCMusic Tool was built for .NET Framework 4, which may be an additional requirement. It is available as a free download from the official Microsoft site. If you need additional help, please post here at modthesims. Copyright (c) 2012, 2013 by InvScribe. All rights reserved. InvScribe is me, invscribe at MTS. I have received permission from myself to share this program on this site. Please download both files. See original post for installation instructions. 3. InCMusic_Tool_1_1_Full.zip is the tool itself. It contains one file. Put the executable in any location. 4. InCM_Presets_All-09192013.zip contains all of the presets as of September 2013, including an updated The Sims 3 preset. 5. InCMusic Tool is now installed. Run InCMusic Tool at any time. I was wondering about iTunes. I didn't think those files were straight mp3s that TS3 could read. This'll be interesting to test, once my re-install is set up. iTunes converts everything, including mp3s, to m4a by default. M4a cannot be read by TS3, and therefore cannot be used. IIRC, there is a setting which changes this automatic conversion behavior. Unfortunately, I do not have or use iTunes, so I cannot verify that the setting is still implemented. No. As far as I know, the tvs have yet to be hacked. i keep getting a error when trying to open this tool "the language en-us has not been translated or could not be found. defaulting to en-us" witch is wierd. the only way to close it down is going in to task manager and ending the proces there. any idea what could be the problem? I cant download. My anti-virus program detects it as a Trojan Virus in it. Anyone else have this problem? Please PM me and let me know what AV program is doing that so that I can look into it. InCMusicTool is not remotely a virus, and contains no malicious code; but being a system-level tool using uncommon methods, the AV program you are using has flagged it. That is very interesting, and I'd like to know more. I have sent you a PM. Thanks! I'm getting tired of listening to the same old TS3 music!!! A newer version has been out for some time. It works with The Sims 3 and 4, as well as GTA V, among other new features. It's available at http://invscribe.com/ I don't know if I should post the upgraded version in TS4 section or what, so for now it's just on the site. Cheers! I don't expect this to be ported to mac, as it uses features that are unique to Windows. BTW, the site is back up. Thank you. Wow I've been looking for something like this in a while! Thank you so much! Would I use this mod to change the music in build/buy mode or just be a custom music channel boardcast in Hi-Fi? 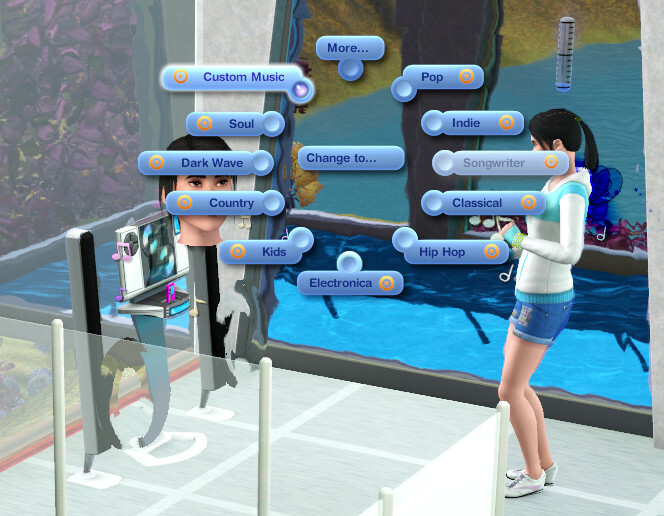 In The Sims 3, you can select the Custom Music station from any radio/ Hi-Fi. This does not change the other music. It doesn't work. It always gives me the "Could not copy" error. P.S. I am not affiliated or work for EA in any way, shape, or form, and all my fixes are from my personal experience. If you are having trouble with your game and I didn't help out, check out Crinrict's blog. Sorry for the late reply. I have sent you a PM so we can find out what has happened in your case.